WSU Extension scientists work with Northwest growers, gardeners, and communities, sharing discoveries that protect tree fruit crops, build community consensus, and garden successfully and sustainably. Timeless Traditions: Conducting Council Circles in a Modern World (FS320E), by Mike Wallace, WSU Regional Specialist for youth and families, shares how communities and groups can benefit from council circles, long been valued by indigenous cultures as the practice for building community and consensus. Use of Protective Netting in Washington State Apple Production (TB60E), a guide by Giverson Mupambi, postdoctoral researcher with WSU Tree Fruit Research & Extension, WSU Horticulture scientists Stefano Musacchi and Sara Serra, former WSU scientist Des Layne, and Washington Tree Fruit Research Commission scientists Tory Schmidt and Ines Hanrahan. Phytophthora Crown, Collar and Root Rot of Apple and Cherry (FS322E), by WSU Tree Fruit Extension Specialist Tianna DuPont, Cal-Poly researcher Shashika Hewavitharana, and USDA-ARS plant pathologist Mark Mazzola. Learn about three different strategies to control damaging diseases. Do Black Walnut Trees Have Allelopathic Effects on Other Plants? (FS325E, Home Garden Series), by Extension Horticulturist Linda Chalker-Scott. Learn about current research into whether black walnut harms other plants, and discuss the practical significance of gardening in the presence of black walnut trees. 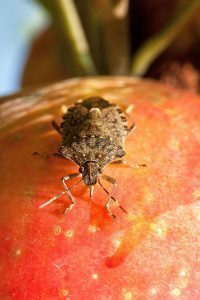 The 2019 Crop Protection Guide for Tree Fruits in Washington (EB0419), outlining controls orchard insect, disease, and weed pests in Washington state. Contributors include Tianna DuPont, Elizabeth H. Beers, Louis Nottingham, Gary Grove, Achour Amiri, Catherine Daniels, Tory Schmidt, Joel Kangiser, Michael Klaus, Lagene Taylor, Gerald Steffen, and Wendy Jones. Cornmeal and corn gluten meal applications in gardens and landscapes (FS326E, Home Garden Series). Linda Chalker-Scott reviews whether cornmeal and corn gluten meal have legal, practical uses in home gardens and landscapes. Unmanned Aerial Systems in Agriculture: Part 3, (FS321E), by Lav Khot, Assistant Professor, WSU Center for Precision and Automated Agricultural Systems; Gwen-Alyn Hoheisel, WSU Regional Extension Specialist, and Jianfeng Zhou, Agricultural Systems Management, University of Missouri. Learn about mid-sized Unmanned Aerial Systems (UAS), or drones, in agriculture and what they can do for your crop production. A guide to Apple Replant Disease (FS323E), by Hewavitharana, Dupont and Mazzola. Learn about the symptoms, cause and management of a disease that costs growers thousands of dollars in lost productivity. Each week, we showcase one of our CAHNRS Ambassadors, a student leadership organization that encourages students to pursue higher education and serves as a liaison between the college and the greater community. 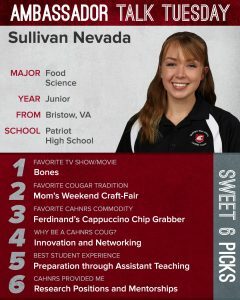 This week, we’re featuring Sullivan Nevada, a junior from Bristow, Virginia. I’m majoring in Food Science. My favorite Cougar traditions would have to be Mom’s Weekend and Dad’s weekend. The whole energy on campus changes with the incoming parents and families. Although my dad is currently deployed, he made it to Dad’s Weekend last year and we made memories that I will always cherish between the football game and the other on-campus events. The one tradition that I go to whether or not my parents and family are in town is the Mom’s Weekend craft fair. It’s incredibly interesting to see all of the vendors selling their Coug themed gear and showing off the variety of skills and talents that our community has to offer. I am always excited to go check out the booths and invest in the local vendors. Anything from Ferdinand’s and the Creamery! Since both of these producers fall under the Food Science department, all of the CAHNRS commodities produced from Ferdinand’s and the Creamery are near and dear to my heart. You cannot go wrong with a cold scoop of Ferdinand’s ice cream on a warm day and the Cougar Gold Cheese is our namesake for a reason! If I had to choose of all the amazing options I would have to say that the Cappuccino Chip Grabber is my favorite and one CAHNRS commodity that I cannot live without. Why be a CAHNRS Coug? I knew from the beginning of my college career that I wanted to be a food scientist. That determined the school that I chose as well as the college. I found a community within CAHNRS despite its misconception as only the school of agriculture. Many people don’t know it is much larger than that; our college is a network, an interconnected community of individuals that provide an essential necessity for the general population. 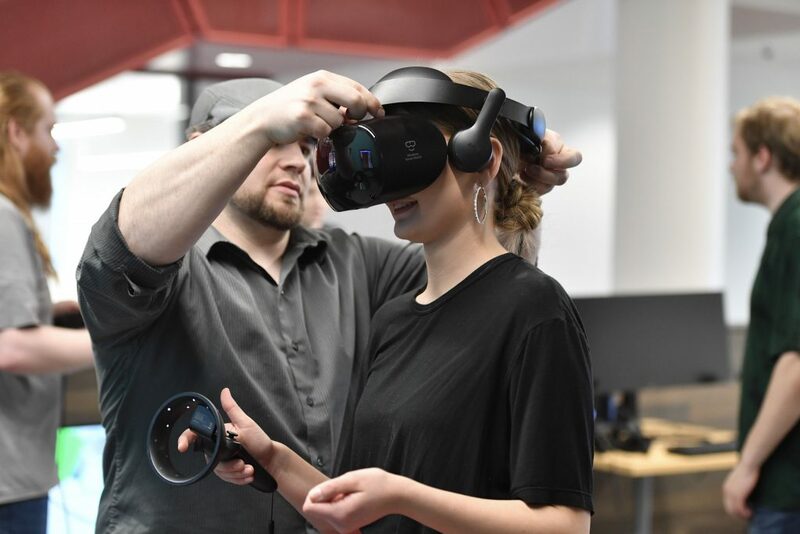 The connectivity of this college is a major part of the value, and the point of higher education is to find innovative solutions to the problems faced within the industry. One of the best experiences that I have had as an undergraduate was the opportunity to be an assistant teacher for the Biology 107 lab. 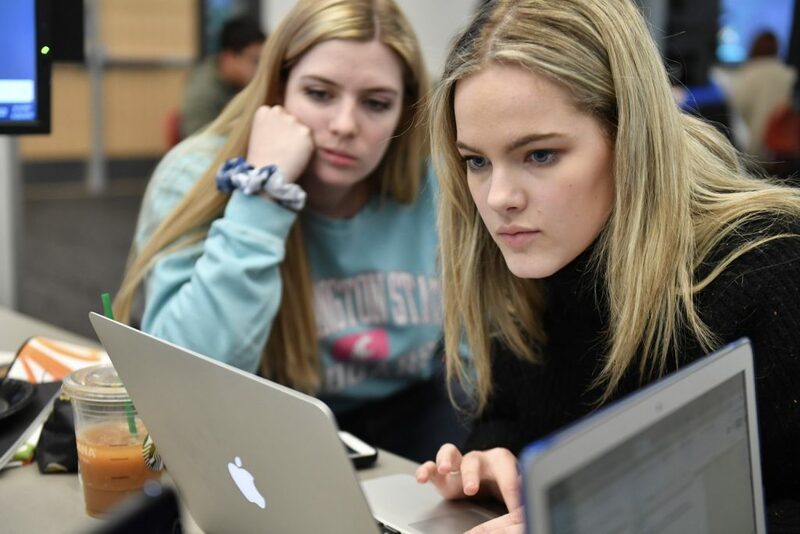 Since I was able to see things from the other side of the desk and help my fellow students by drawing upon my own experience from taking the class, I developed a deeper understanding of the institutional teaching methods used here at WSU. The class was also part of a larger study under the School of Molecular Biosciences on how to improve social teaching of science-based classes which really opened my eyes to the struggles of teaching higher level learning. This experience is preparing me to meet the expectations of my future as a student and a professional. CAHNRS taught me the value of learning through mentorship and how communicating one-on-one with experienced professionals can be a valuable resource as well as a more intensive method of learning. The best experience I have gained from my time here at WSU is the availability of research positions and the qualified, seasoned mentors that I have had the pleasure of learning from. I began research during my first year through the Ignite! Undergraduate Research initiative program, which gave me a leg up and allowed me to gain the necessary experience needed for the USDA research lab I work in now. I have found a path that I genuinely enjoy, and it has shown me many possible paths for my future career. Strengthening seeds and crops against devastating diseases to help local farmers achieve food security, work by an international team of scientists is bearing fruit in Nepal. For more than five years, Naidu Rayapati, WSU plant pathologist, IAREC director and CAHNRS assistant dean at WSU Tri-Cities, has partnered with scientists at Virginia Tech’s IPM Innovation Lab, funded by USAID’s Feed the Future program, offering trainings and workshops in Nepal on sustainable pest and disease management. 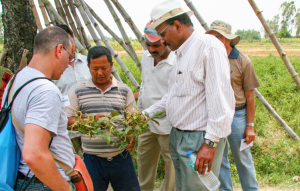 Rayapati and colleagues display virus-infected chillies at an IPM Innovation Lab training in Nepal. 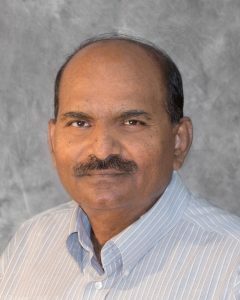 His work was featured recently in a success story on Samir Regmi, whose agricultural supply company in Nepal found success through integrated pest management, or IPM. Business is booming for Regmi, as he sells virus-free seeds for tomatoes, chilis, and other crops. Offering a sustainable approach to pest management that relies on predators and an understanding of pest and disease cycles and shelters, IPM helps decrease our reliance on synthetic pesticides. Education in IPM is an important tool in strengthening seed supply systems to maintain enduring vegetable crops and food security globally. Results of that outreach can be seen in bountiful, healthy harvests in Nepal, and in the success of local businesses like Samir Regmi’s. 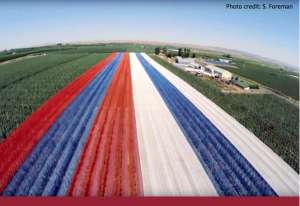 Read the full story, “Agri-business Blooms out of IPM Innovation Lab Partnership,” here. Three years ago, Macy Hagler watched her older sister Jenica receive the Aggie of the Year award at the 2016 CAHNRS Honors. She realized that this award truly encompassed what it meant to be a dedicated CAHNRS Coug. 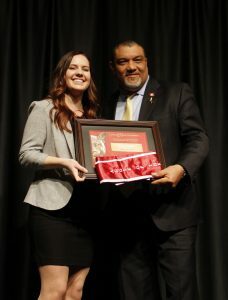 Macy Hagler receives the Aggie of the Year of the Year award from Dean André-Denis Wright at CAHNRS Honors. “It encouraged me to strive for the best in my coursework and take advantage of outside opportunities, even if they demanded extra time,” Macy said. While her college path began with a degree in Agricultural Biotechnology, a study abroad trip to Ecuador changed this trajectory. Macy switched to a degree in Agricultural and Food Security after seeing the possibility of solving problems in agriculture through the entire agricultural system. Macy has done as much as she can with her time at WSU to ensure this happens with her involvement with organizations such as CAHNRS Student Senate, CAHNRS Ambassadors, CAHNRS Young Farmers and Ranchers, and the WSU Alpine Ski team. Her activities also include her participation in national organizations such as Agriculture Future of America (AFA). Through these activities, Macy has gained invaluable experience, professional skills, and irreplaceable memories that have made her the student and future professional that she is today. Macy, with the help of her family and friends, was a leader on campus and in those organizations. She leaves behind a legacy through her hard work and commitment to bettering agriculture. She nexts moves on to work as a credit officer trainee for Northwest Farm Credit Services starting in July. 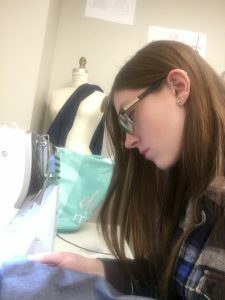 When Ashley Wright came to WSU, she brought a determination to use her passion for clothing and design to make a real change in the clothing industry. 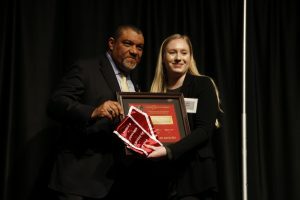 Ashley Wright receives the Family and Consumer Scientist of the Year award from Dean André-Denis Wright at CAHNRS Honors. That commitment led to Ashley receiving the 2019 Family and Consumer Scientist of the Year award at this year’s CAHNRS Honors, an award that is very close to Ashley’s heart. The senior Apparel, Merchandising, Design and Textiles (AMDT) student from Concord, Calif. overcame many obstacles, which showcases her commitment not only to her education and passion, but to her family as well. He would also be incredibly proud of her for all the hard work she has put in and all of her other accomplishments during her four years in Pullman. While at WSU, Ashley has invested in her future and family not only through degree in AMDT, but her participation in activities as well. A student ambassadorship with CottonWorks, an International Center Marketing internship, and acting as AMDT treasurer as well as a job with the Bookie has kept Ashley busy. But is has all helped her grow into the student she is today. Aside from these activities, Ashley has also been an academic leader with WSU Innovation Corps (I-Corp); an organization that strives to move “academic research to the marketplace.” Ashley used the information she got from researching how to take waste from recycled cotton and use it for regenerated fibers for WSU I-Corp.
She presented her research at the International Textile and Apparel Association’s annual conference and the annual Showcase for Undergraduate Research and Creative Activities (SURCA) where she was awarded the Gray Award in Applied Sciences. Ashley plans to attend the University of Oregon for their Sports Product Management Program. She hopes to make a difference with this program and pursue a career with a sustainably focused sportswear company. To learn more about CAHNRS Honors, visit https://cahnrs.wsu.edu/honors/. 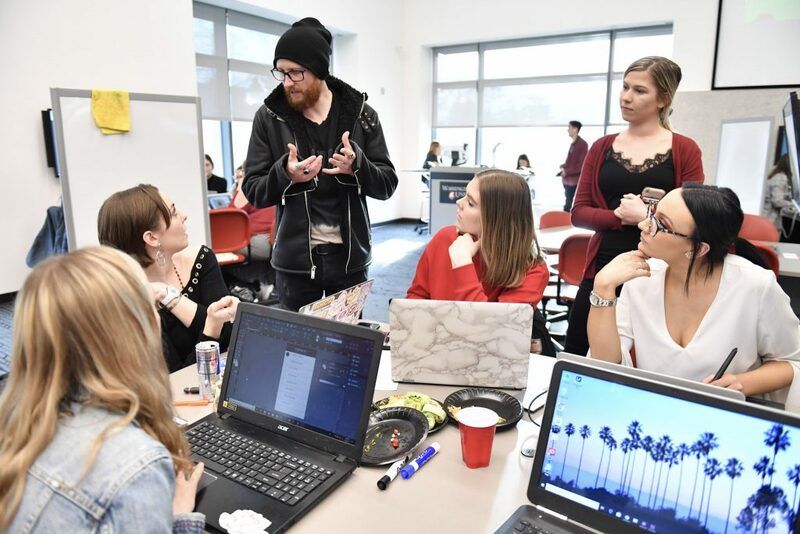 More than 45 Apparel, Merchandising, Textiles & Design students at Washington State University teamed up to solve design challenges in the Spring 2019 Adobe Creative Jam, held March 28 at Pullman. 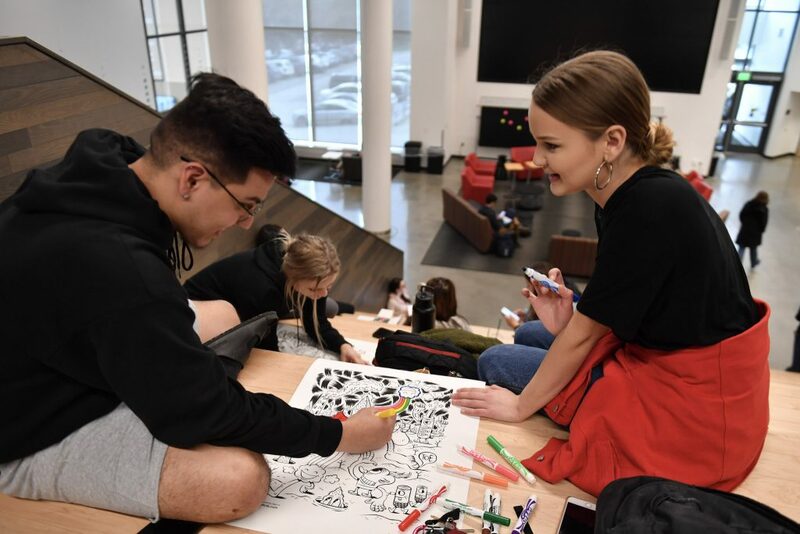 AMDT had the largest representation of any WSU department at Creative Jam, a three-hour competition sponsored by Adobe in which students work together on a hands-on creative challenge. 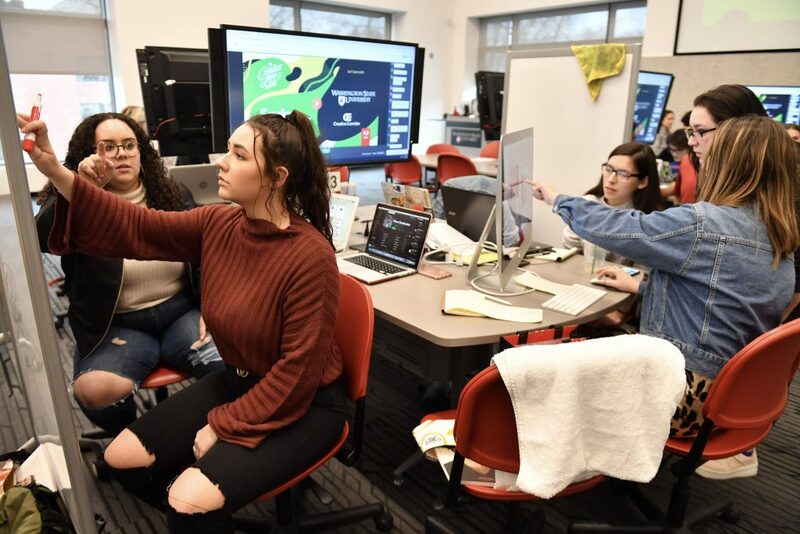 For this year’s event, students used Adobe software skills, virtual reality, and artistic and creative concepts in a design project on mindfulness—the state of being fully present in the moment. Winning teams earned software and gift certificate prizes. AMDT students Erin Crosier, Jessica Clark and Ellie Erickson were part of the second-place team, while Jessica Parsons was part of the team that took third place. Patrick Brown-Hayes, clinical instructor in AMDT, was a co-host and organizer of this year’s Creative Jam, and is an active member of WSU’s Creative Corridor, which offers students and faculty access to creative opportunities and technologies. AMDT student participants included Audrey Richardson, Jayde Filipiak, McKenzie Duquaine, Jacqueline Sewell, Haley Smith, Freda Feng, Savannah Stroobandt, Ali McDonald, Victoria Michels, Bryn Justis, Brigitte Ellering, Hannah Hughes, Camilla Goetz, Connor Gray, Jansen Garside, Jackson Fosseen, Landon Rice, Maxwell Philippo, Erin Crosier, Ellie Erickson, Jessica Clark, Brandon Dunbar, Meladie Hoff, Jennifer Furman, Hailey Cribbs, Olivia Taylor, Jess Daher, Jessica Parsons, Jhon Dimaculangan, Zichu Wu, Charles Stockbridge, Sarah Kopta, Kassy Edeza-Rodriguez, Jeanette Arellano, Nicole Tesdahl, Berenice Diaz, Quinn Cooney, Gratia Doerr, RobbiAnn Cabaniero-Buendia, Alexis Wyatt, Kaley Mozell, Eilish Rising, Bridgette Bacon, Larkin Farrish, Tara Kelly, Kyung Min Lee, and Madison Norman. Learn more about Creative Jams here. Find the latest discoveries by WSU Extension specialists working to protect our homes, orchards, and farms against destructive weeds, diseases, and insect pests, in a quarterly newsletter from Extension’s Integrated Pest Management team. Doug Walsh, professor of entomology and Washington State Integrated Pest Management (IPM) Coordinator, and Sally O’Neal, Senior Research and Extension Communication Specialist, post updates every three months on the WSU IPM website. Subscribe here. Providing valuable knowledge to agricultural and urban pest managers across the Northwest, WSU’s IPM program helps grow sustainable, successful practices, reduce human health risks, minimize environmental impacts, and support our economy. This project is supported by the Crop Protection and Pest Management Program [grant no. 2017-70006-27138/project accession no. 1014221] with USDA’s National Institute of Food and Agriculture. Each week, we showcase one of our CAHNRS Ambassadors, a student leadership organization that encourages students to pursue higher education and serves as a liaison between the college and the greater community. 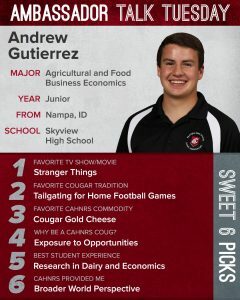 This week, we’re featuring Andrew Gutierrez, a junior from Nampa, Idaho. I’m majoring in Agricultural and Food Business Economics. Hanging out with friends and family at tailgates before a Cougar home football game has to be my favorite Cougar tradition. Nothing beats waking up to the sound of the WSU Fight Song and knowing that it’s going to be a day of BBQ, good friends, and football. Football is that one thing that can bring all sorts of people together for one single cause: to win! Since the day I was born, I have been eating Cougar Gold Cheese. It has always been a family tradition for us to open a can for any and all family gatherings. It’s almost become an expectation to give cans of Cougar Gold for Christmas presents as well. While all the varieties are great, my favorite has to be the Apple Smoked Cougar Gold. CAHNRS actively creates opportunities for students to learn about different topics and issues that they otherwise wouldn’t consider. Whether that be a class that’s not required, a conversation with an industry partner at a CAHNRS Networking Night, a debate with a classmate from a different major within CAHNRS, or an internship opportunity that came out of the blue, CAHNRS is constantly striving to give students exposure to as many opportunities as possible! Thanks to the CAHNRS Ignite Program, I was able to use my background in the Dairy Industry and interest in economics to work with Dr. Shannon Neibergs in the School of Economic Sciences on a Replacement Dairy Heifer research project. This not only united my interest in dairies and economics, but also provided me with an opportunity to grow as an individual, as a student, and as a professional. CAHNRS teaches you to look at the bigger picture and to try to understand all the different sides to a trending issue. As a school that has a diverse structure of majors and interests, there are always many sides to one topic. CAHNRS encourages students to take a step back and realize those different perspectives and try to learn from them. Each week, we showcase one of our CAHNRS Ambassadors, a student leadership organization that encourages students to pursue higher education and serves as a liaison between the college and the greater community. 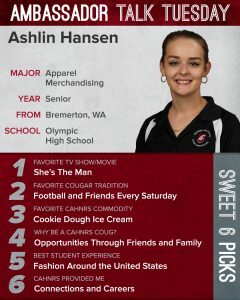 This week, we’re featuring Ashlin Hansen, a senior from Bremerton, Wash.
I’m majoring in Apparel Merchandising. My favorite tradition as a Cougar is going to the football games with my best friends. Spending Saturday in Martin Stadium, surrounded by all my close friends, feels like home. Everyone else in Martin Stadium is just as excited as I am, and it is one of the best environments to be in. There is nothing like cheering on my favorite team with some of my favorite people! My favorite CAHNRS commodity is the cookie dough ice cream from Ferdinand’s. When I came to my Alive Orientation as a freshman, I tried Ferdinand’s Cookie Dough Ice Cream for the first time. I am not ashamed to say that I have been stuck on it ever since. It is one of those treats that are worth the walk to the far side of campus whether it’s sunny, raining, or even snowing! Being a CAHNRS Coug has provided me with many amazing opportunities to meet new people, especially inspirational alumni. Through these encounters and opportunities, I have been able to develop my professional skills far beyond what I expected. Being a CAHNRS Coug means you are a part of a huge support system where friends are more like family. Everyone, students and alumni alike, have that “Cougs help Cougs” mentality and are constantly pushing and inspiring others to succeed. My best student experience was going on a Fashion Study Tour to Los Angeles last Spring break. It wasn’t a difficult decision and I was very excited up to the day we left. I had so much fun touring big companies like Vans and Guess HQ, where I got to connect with many great people from the industry. Going on the study tour even inspired me to look for career opportunities in the L.A. fashion industry after I graduate, something I hadn’t considered before going on this trip. CAHNRS has prepared me in so many ways. My advisor has always been there to help when needed and always has new opportunities and ways to get more involved in my major. They have helped guide me to where I am today and continue to support me. I have had an amazing chance to be an Apparel, Merchandising, Design, And Textiles Ambassador as well as attend a Fashion Study Tour and help with the Mom’s Weekend Fashion Show. These accomplishments are only a taste of all the connections that CAHNRS has provided me over the years. The people I have networked with through these opportunities, as well as others, have provided me with valuable knowledge as both a student and future employee. I hope to someday work with these connections I have made while in CAHNRS. This weekend, 16 WSU seniors will watch their designs walk the runway at the 36th annual Mom’s Weekend Fashion Show. After months and years of hard work, the students will watch their diplomas get closer with each step. Design student Danielle Hoblin works on a piece for her lineup at the AMDT Fashion Show. The fashion show is this Friday, April 12, at 6:00 pm in Beasley Coliseum, with a Wine and Beer Garden opening at 5:00 pm. The fashion show is an opportunity for the senior designers of the WSU Apparel, Merchandising, Design and Textiles (AMDT) department to take the skills they have learned over the past four years and use them to design and create their own line of clothing unique to themselves. It’s the first time that the designers get the chance to show off everything they have learned. “It’s finally the time for us to show the world what we’re made of,” said designer Madison Norman. This year’s theme, Emerge, brings to attention this opportunity for designers to show their passions, interests, and skills; the chance to create anything. Designs vary from underwater wedding and world-wide street wear to the Danse Macabre and bridal-wear inspired by the Western United States. Tickets for the program are $15 in advance, and $20 at the door. To learn more visit http://amdtfashionshow.com/.